Molecular evolution and neutral theory - What were Kimura's arguments for neutralism? Another important figure is for the amount of genetic variation within a species at a particular time. In 1966 gel electrophoresis was used to estimate the average amount of genetic variation in humans and in the fruitfly Drosophila . 1. The chance that two randomly drawn alleles differ at an average locus: the amount of heterozygosity in a genome. It is measured for a number of loci and an average is taken. 2. The percentage of polymorphic loci. If, say, 20 loci are studied by gel electrophoresis, and 16 show no variation and four have more than one band on the gel, then polymorphism would be 4/20 x 100 = 20%. Gel electrophoretic evidence suggests that about 10-20% of loci are polymorphic in species in nature. Kimura found these numbers - for the rate of evolution and the level of genetic variation - too high for proteins to have evolved by natural selection. Table: amount of variation in natural populations. Variation can be measured as percentage of polymorphic loci (P) and average percentage heterozygosity per individual (H). 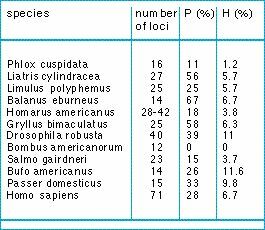 Also given is the number of gene loci used to estimate P and H. From Nevo (1988).